Background: Intrauterine growth retardation (IUGR), that is, an estimated fetal weight less than ten percent of the standard weight for gestational age, is one of the important challenges in modern obstetrics, the management and treatment of which is cause-dependent. Given the lack of an accepted treatment for these patients, this study aimed to introduce a treatment commonly used by Iranian traditional therapists for the improvement of both maternal and fetal weight gain, which is based on nutrition with considerable therapeutic outcomes. Case Presentation: A 27-year-old female patient with singleton pregnancy at the 30th week of pregnancy was referred to the prenatalogy clinic at AkbarAbadi Hospital, Tehran, for routine examinations in February 2016. The fetus ultrasound showed a weight below the 10th percentile of the standard pregnancy weight, hence, IUGR was diagnosed. The mother was not malnourished according to the body mass index before pregnancy, the weight at the first visit, and the evaluation result obtained by the nutritional status questionnaire named recall questionnaire. The diet contained foods that create righteous, humid and warm phlegm in Iranian traditional medicine. The mother's dietaty needs were taken into account and one month prescription was done based on modern medicine. The examination and fetal health were monitored biweekly through phone calls and biometric ultrasound every two weeks. The patient returned to normal diet at the end of 34 weeks. An increase in fetal growth percentile from 10 to 50% was observed in the two ultrasounds performed two and four weeks after the treatment. Conclusion: The production of righteous, humid and warm phlegm by the recommended foods in Iranian Traditional Medicine consumed by the mother clearly improved the fetal growth within one month. When the recommended foods were discontinued and the mother returned to the previous nutritional status, the fetal growth showed a downward trend despite having received enough energy and protein. The intrauterine growth retardation (IUGR) is an estimated embryo weight less than 10% of the standard weight for gestational age  . The prevalence varies in different communities with various socioeconomic conditions, but at best, ten percent of pregnancies are associated with this problem . Fetal development is one of the most important predictors of pregnancy outcomes. IUGR is directly correlated with increasing mortality and morbidity rates of both the fetus and the newborn. It is also associated with some perinatal complications such as pre-maturity, cerebral impulse, intrauterine fetal death (IUFD) and infant mortality, as well as diseases in adults such as obesity, hypertension and Type II diabetes  . According to theAmerican College of Obstetricians and Gynecologists, IUGR is the most complicated problem in modern obstetrics  . The treatment and management strategies for IUGR include faster case and cause diagnosis. Often, the cause of IUGR is not specified, but the causes identified include embryonic factors (infections, deformities and chromosomal disorders), placental factors (chorioangioma, infarction, etc. ), maternal factors (chronic hypertension, pre-pregnancy diabetes, cardiovascular disease, autoimmune disorders, nutritional disorders, etc. ), and external factors such as inherent IUGR  . After pre-maturity, IUGR is the second cause of perinatal mortality. The mortality is caused by increased risk of complications such as hypoxemia, low Apgar score, and umbilical cord blood acidemia which can lead to negative neonatal consequences. In most cases of uncaused diagnoses, fetal blood flow and growth are examined through frequent pursuit. Once an abnormal blood disorder is diagnosed, the pregnancy is terminated to reduce the IUFD cases  . In developing countries, the main cause is maternal malnutrition before and during pregnancy, hence, fetal growth improves with a better nutrition of mothers. However, nutritional interventions in mothers without malnutrition have not affected fetal development [4-6] . Undoubtedly, nutrition is one of the factors affecting the health of both mother and infant. Numerous studies suggest the noticeable contribution of nutrition to the prevention and treatment of perinatal complications [4, 5]. Iranian scholars have paid a considerable attention to nutrition in both aspects: prevention and treatment. With regards to prevention, paying attention to food and beverages is one of the six principles of health. Prior to treatment by medication and manipulation, there are quantitative and qualitative interventions in the nutrition of patients [7, 8] . If the nutritional treatment is not effective, then, it is recommended for medication and/or manipulation . In the literature of Iranian Traditional Medicine (ITM), a variety of foods have been introduced, which regardless of the calorie contents, cause bodily growth due to the fact that they provide the body with humidity and appropriate warmth based on the rules available in that medicine. The therapists of Iranian traditional medicine administer such foods during pregnancy in order to improve embryos with IUGR [10, 11]. This article aimed to present a successful case of uncaused asymmetric IUGR treatment, using a balanced diet prepared on the basis of ITM. The case was a 27-year-old female patient with the first and singleton pregnancy at the 30th week, referred to the prenatology clinic at Akbar Abadi Hospital in Tehran (affiliated to the Tehran University of Medical Sciences) for routine pregnancy examinations. The diagnosis of the fetal IUGR was examined through biometric ultrasound, which revealed no clear signs of other disorders. The gender of the fetus was reported to be female (Figur. 1) and (Table 1). A pre-pregnancy BMI of 19 was estimated according to the patients’ pre-pregnancy weight and height. The patient weighed 61 kg at the first visit. The fetal heart sound was heard and Doppler ultrasound was performed due to the IUGR report, showing normal blood supplies in the umbilical and cerebral arteries. The biophysical profile of the patient was determined and reported to be normal with 8 (Figur. 2). No specific problems were reported in the initial examinations (Table 2). The patient’s pre-pregnancy temperament was diagnosed as cold and dry by a valid temper determination questionnaire . At the first visit (30rd week), no special issues were detected with the exception of poor digestion (a feeling of stomach fullness up to 3 h after feeding and also bloating after meals) and incomplete defecation once a day. This study did not consider the patient's temper due to the variability of temper during pregnancy and the lack of a valid questionnaire for temper determination during pregnancy. After IUGR diagnosis, routine examinations were conducted to detect the cause of growth retardation. The IUGR was diagnosed to be uncaused, considering the fact that the patient took iron supplements from the beginning of the pregnancy, took calcium supplements, had a normal BMI range, there was no sign of infection in the mother, and there was a normal anomaly scan. The fetal heart sound was heard and Doppler ultrasound was performed due to the IUGR report showing normal blood supplies in the umbilical and cerebral arteries. The biophysical profile was determined and reported to be normal with 8 (Figur. 2). No specific problems were reported in the initial examinations (Table 2). The patient received routine clinical care. The material and food components were selected from five books namely the Canon of medicine, Exireazam, Moalejateaghili, Sharholasbab and Tebeakbari. Based on the books, foods are classified into the following: heat and humidity maker (mosakhen va morateb in Persian), blood producing (movalededam in Persian), heat and softness maker (mosakhen va molatef in Persian), fine food (latif in Persian), nutritious food (moghavi in Persian), good and humidity maker food (saleh alkimoos va morateb in Persian), good substance and light food ( jaeedaljohar va latif in Persian), good moisturizer food (mahmoode morateb in Persian), rapidly digested foods (sarialhazm in Persian), fattening food,and easily digested foods based on the availability and matching of the Iranians’ graded food priorities, which were used as the common food compositions in the Iranian diet . The patient's previous weight, age and height were used based on the modified Harris Benedict’s formula for calculating the amount of energy needed for the base metabolism. The base energy was multiplied by activity coefficient and the amount of energy needed for pregnant women in the third quarter (452 kcal) was added to the calculated energy. Then, the amount of energy required was calculated as 2000 kcal per day . The amount of energy based on the Exchange list was divided among feeding groups (Table 3) . The patient was provided with the food components in the units considered (Table 4) and was advised to observe the regime for a month. Additionally, the type of meal arrangement was in accordance with the rules of nourishment in ITM, for example, the lack of beverage intake with dry food, eating only one meal per serving, and observing the interval between cooked foods, fruits, and vegetables. In the opinion of the sages of traditional medicine, choosing easily digestable foods and observing the laws of nourishment would result in improved power of all four stages of digestion and production of good phlegm in order to increase body dimensions (growth) [13, 16]. Before the start of the course and within a month, the dietary plan for the patient was checked with the Food Recall questionnaire every ten days and analyzed using the software Food processor . All interventions in this study were in the form of dietary approaches and medicinal interventions were not performed on the patient in both traditional and conventional types of medicine. The first follow-up was performed in person, two weeks after the first visit of the patient to the clinic at Akbar Abadi Hospital. Biometric ultrasound and listening to the fetal heart sounds were performed on the patient (Figur. 3). The patient's nutrition was re-examined through face to face questioning. The results are summarized in Table 3. The second follow-up of the patient was via phone calls. The Food Recall questionare was filled out 20 days after the first visit. The fourth follow-up was almost 31 days after the first visit and the Recall questionare was filled for the patient, who received routine clinical examinations. The ultrasound biometry taken at the 35th week of pregnancy was observed to assess fetal growth (Figur. 3). The ultrasounds taken on the 14th and 31st days revealed an obvious change in the fetal percentile development, which had grown from below 10 to over 25% (almost 50), hence, it was not considered an IUGR case from the 14th day onwards (Table 1). After four weeks, the patient returned to her normal diet and was referred weekly to the prenatology clinic at Akbar Abadi Hospital for her last months of pregnancy. At week 39, the patient was referred to the Akbar Abadi obstetric emergency due to the onset of delivery contractions. A healthy female newborn (2800 kg) was born using induction through normal vaginal delivery on April 20, 2016 (Figur. 4) and (Table 5). The Recall questionaires were analyzed by the FD software in order to estimate the energy intake, macronutrients, as well as vitamins and minerals in the patients’ diet (Table 6). Existing evidence supports the idea that embryos in mothers with inadequate weight gain during pregnancy are more likely to have prematurity than those with proper weight . In a number of studies on animals, IUGR was induced in animal embryos by limiting the total energy intake or merely by reducing protein intake. According to pathological examinations, IUGR in such animals is caused by the insufficiency and inadequate growth of the placenta as a result of energy or protein deficiency [19-21]. In several cohort studies targeting maternal nutritional status, it was clarified that regardless of the energy intake, the type of food taken is also effective in both the maternal and fetal weight gains. For instance, a Japanese study reported that fetuses showed better weight gain in mothers who had a diet of rice and fresh vegetables as compared to those whose main diet was bread [22, 23]. According to epidemiological studies in human, a balanced diet consisting of meat, low-fat dairy, fruits, and adequate vegetables can be effective in desirable weight gain of mothers and the fetus during pregnancy . In nutritional interventions carried out on human, improving nutritional status during pregnancy in conditions of malnutrition was effective in the weight gain of IUGR embryos . Nonetheless, nutritional interventions in mothers with desirable nutritional conditions had no effects on fetal weight gain and small for gestational age (SGA) improvement [24, 25]. In the case presented, a normal-range BMI and the results of Food Recall questionare indicate that the nutritional conditins were appropriate with respect to the intake of micronutrients, macronutrients and energy giving foods. However, the ultrasound at the 31st week and the Callen criteria for the Asian population (2017) reflected an IUGR-affected fetus in the mother. Given the absence of known factors for IUGR, the retarded growth of the fetus was diagnosed to be uncaused. According to previous studies, dietary changes should not have an effect on the fetal weight gain. Nevertheless, a difference in the percentiles of fetal weight was obvious according to the biometric ultrasounds performed in the second and third intervals after starting the diet, so that the fetus was no longer suffering from IUGR, and showed a balanced growth based on the second ultrasound results. Energy intake corresponded to the energy needs in the first Recall, whereas it was 500 kcal less than the energy needed. In the third and fourth Recalls, the energy intake was 200 kcal different from the required energy. The amount of protein intake in the first Recall was slightly less than the minimal amount recommended for pregnant women in Krause’s book. However, the amount of protein intake was sufficient after receiving the diet in the next three recalls. The fat intake dropped significantly after receiving the diet. There was enhanced fetal weight gain despite a reduced energy intake may be due to increased protein intake or the type of diet recommended in the traditional medicine. In the last follow-up after the birth, the percentile fetal weight dropped as compared to a month earlier when the mother was on a diet of traditional medicine. Although she had received adequate amounts of energy and protein according to the analysis of the last Recall of the patient, the types of foods and their consumption were not according to what is recommended in traditional medicine. It can be concluded that the increased weight percentiles reflected in the second and third ultrasounds might be due to consumption of moist and warm foods as well as observance of dietary laws based on Iranian traditional medicine. Moreover, failure to use the above foods and nonobservance of the rules might have led to a drop in percentile fetal weight from 25-50 to 10-25 in the final month. Taking into account the previous findings, could provide effective clinical facilities for the treatment of challenging diseases such as IUGR, which would yield astonishing therapeutic results in combination with modern medicine. In this regard, the potential of treatment via nutrition as a low-complication and non-invasive method should not be ignored in the treatment of diseases. This paper presents the results of the research conducted by Dr. Yalda Rumi. Patient visits and ultrasounds were performed by Dr. Shahrzad Hashemi. Dr. Gholamreza Mohammadi Farsani supervised the diet planning. Dr. Roshanak Mackbernejad and Dr. Rumi were involved in the writing of this article. The authors are grateful to the patient and her family for their cooperation, participation and completion of the care processes. N. Giuliano, M. L. Annunziata, S. Tagliaferri, F. G. Esposito, O. C. M. Imperato, M. Campanile, et al. IUGR Management: New Perspectives. Journal of Pregnancy 2014; 2014: 1-8. Group, G.S. A randomised trial of timed delivery for the compromised preterm fetus: short term outcomes and Bayesian interpretation. BJOG 2003; 110(1): 27-32. Abu-Saad, K. and D. Fraser. Maternal nutrition and birth outcomes. Epidemiologic reviews 2010; 32(1): 5-25. Chong MF, Chia AR, Colega M, Tint MT, Aris IM, Chong YS, et al. Maternal Protein Intake during Pregnancy Is Not Associated with Offspring Birth Weight in a Multiethnic Asian Population. J Nutr. 2015; 145(6): 1303-10. Cheshti MA. Exir-e Azam (Azam’s Elixir). Tehran: Iran University of Medical Science, Institute for Islamic and Complementary Medicine; 2007. Avicenna. The Canon of Medicine (Al-Qanon fi al-Tibb). Beirut; Dar Ihyaa al-Turaath al-Arabi; 2005. Alrazi A., Kitab al-Hawi fit-tibb. Edited by the Bureau. The book of the collector of medicine Hyderabad: Osmania Oriental Publications, Osmania University; 1961. Bius, S. Tadabire dorane bardari dar tebe sonati. Tehran: Choogan; 2013. Ebnesina, h. Ghanoon. Beyroot: darelehya altorasel arabi; 1426 AH. Morteza Mojahedi, Mohsen Naseri, Reza Majdzadeh, Mansoor Keshavarz, Mohammad Ebadini, Esmaeil Nazem, Mohsen Saberi Isfeedvajani. 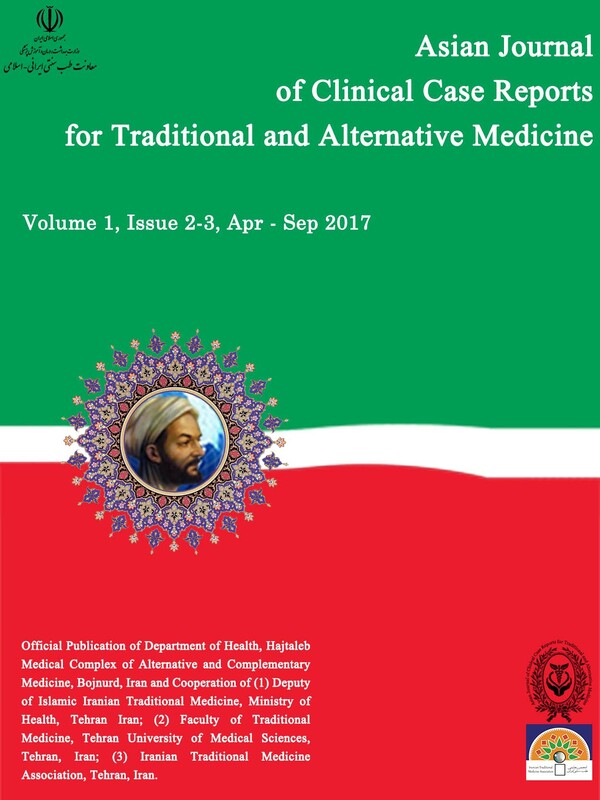 Reliability and Validity Assessment of Mizaj Questionnaire: A Novel Self-report Scale in Iranian Traditional Medicine. Iran Red Crescent Med J. 2014; 16(3): e15924. Nejatbakhsh, f. Principles of nutrition in diseases based on principles of Iranian Traditional Medicine. Tehran: Choogan; 2013. Roza, A.M., H.M. Shizgal. The Harris Benedict equation reevaluated: resting energy requirements and the body cell mass. The American journal of clinical nutrition 1984; 40(1): 168-182. Krause, M.V. Food, nutrition and diet therapy. UK: Saunders; 1979. Mahdi Borhani, Fariba Khoshzaban, Behzad Jodeiri, Mohsen Naseri, Mohammad Kamalinejad. Diet and food in Iranian traditional medicine: Hints for further research. International journal of preventive medicine. Int J Prev Med. 2014; 5(11): 1480–1481. Castell, G.S., L. Serra-Majem, L. Ribas-Barba. What and how much do we eat? 24-hour dietary recall method. Nutr Hosp 2015. 31(Supl 3): 46-48. Louiza Belkacemi, D. Michael Nelson, Mina Desai, Michael G. Ross. Maternal Undernutrition Influences Placental-Fetal Development. Biology of Reproduction 2010; 83(3): 325–331. Nina Jansson, Jessica Pettersson, Allah Haafiz, Anette Ericsson, Isabelle Palmberg, Mattias Tranberg. Down-regulation of placental transport of amino acids precedes the development of intrauterine growth restriction in rats fed a low protein diet. J Physiol. 2006; 576(Pt 3): 935–946. Priyadarshini Pantham, Fredrick J. Rosario, Susan T. Weintraub, Peter W. Nathanielsz, Theresa L. Powell, Cun Li Thomas Jansson. Down-Regulation of Placental Transport of Amino Acids Precedes the Development of Intrauterine Growth Restriction in Maternal Nutrient Restricted Baboons1. Biology of Reproduction 2016; 95(5): 1-9. Rutland CS1, Latunde-Dada AO, Thorpe A, Plant R, Langley-Evans S, Leach L. Effect of gestational nutrition on vascular integrity in the murine placenta. Placenta. 2007; 28(7): 734-42. Grieger, J.A. and V.L. Clifton. A review of the impact of dietary intakes in human pregnancy on infant birthweight. Nutrients 2014; 7(1): 153-178. Gresham E, Byles JE, Bisquera A, Hure AJ. Effects of dietary interventions on neonatal and infant outcomes: a systematic review and meta-analysis. Am J Clin Nutr. 2014; 100(5):1298-321. Imdad A., Z.A. Bhutta. Maternal Nutrition and Birth Outcomes: Effect of Balanced Protein‐Energy Supplementation. Paediatric and Perinatal Epidemiology 2012; 26(s1): 178-190. Mary Norton. Callen's Ultrasonography in Obstetrics and Gynecology. 6th Edition. Elsevier: 2017.